SAMSUNG Exynos 9 Series 9820 processor with On-device AI processing, 8K video recording and Mali-G76 GPU announced. Samsung Electronics today announced its latest premium application processor (AP), the Exynos 9 Series 9820, equipped for on-device Artificial Intelligence (AI) applications. The Exynos 9820 features a fourth-generation custom CPU, 2.0-gigabits-per-second (Gbps) LTE Advanced Pro modem, and an enhanced neural processing unit (NPU) to bring new smart experiences to mobile devices. 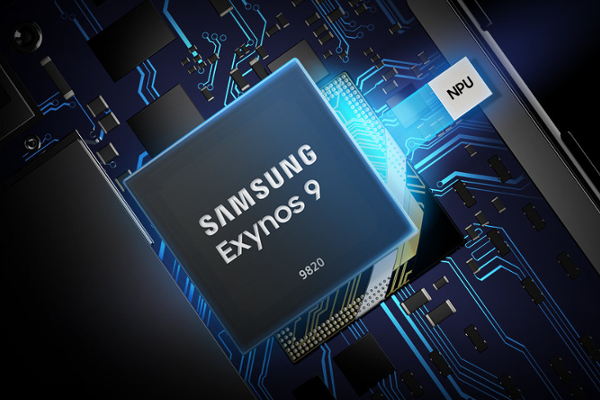 The Exynos 9820 is an intelligent powerhouse with a separate hardware AI-accelerator, or NPU (Neural Processing Unit), which performs AI tasks around seven times faster than the predecessor. With the NPU, AI-related processing can be carried out directly on the device rather than sending the task to a server, providing faster performance as well as better security of personal information. The NPU will enable a variety of new experiences such as instantly adjusting camera settings for a shot based on the surroundings or recognizing objects to provide information in augmented or virtual reality (AR or VR) settings. Featuring a 4th generation custom CPU, the Exynos 9820's innovative tri-cluster architecture delivers premium processing power. The CPU consists of two custom cores for ultimate processing power, two Cortex-A75 cores for optimal performance, and four Cortex-A55 cores for greater efficiency, resulting in superior performance that lasts. Tri-cluster with intelligent task scheduler boosts multi-core performance by 15 percent when compared to the Exynos 9810, while the 4th generation custom CPU with enhanced memory access capability and cutting-edge architecture design improves single core performance by up to 20 percent or boosts power efficiency by up to 40 percent. 8nm LPP (Low Power Plus) FinFET process reduces power consumption by up to 10 percent compared to 10nm LPP process3, while the Exynos 9820 also optimizes power consumption of CPU and GPU through reduced operating voltage, idle, and leakage power. The new mobile processor embeds the latest Mali-G76 GPU cores, which deliver a 40-percent performance boost or 35-percent power savings, allowing longer play time of graphic-intensive mobile games or interactive AR applications. The LTE-Advanced Pro modem in the Exynos 9820 brings fast mobile broadband speeds of 2.0Gbps downlink with 8x carrier aggregation (CA) and 316 megabits-per-second (Mbps) uplink. At 2.0Gbps downlink speed, an FHD high-definition movie (3.7GB) can be downloaded in about 15 seconds and massively multiplayer online games (MMOG) can be played with less lag. With more aggregation of carriers than the previous solution along with 4×4 MIMO (Multiple-Input, Multiple-Output), 256-QAM (Quadrature Amplitude Modulation) scheme, and enhanced Licensed-Assisted Access (eLAA) technology, the modem delivers stable yet blazing speed on the go. For more immersive multimedia experiences, Exynos 9820's multi-format codec (MFC) supports encoding and decoding of 4K UHD video at 150 frames per second (fps). The MFC also renders colors in 10-bit, delivering more accurate representation of color by offering a wider range of tones and hues. The Exynos 9820's advanced image signal processor (ISP) supports up to five sensors, including an IR sensor, to enable flexible multi-camera solutions. Record precious memories in extraordinary detail with the Exynos 9820's multi-format codec (MFC), which supports encoding and decoding of 8K videos at 30fps. By rendering colors in 10-bit and a wide range of tones and hues, the Exynos 9820 delivers life-like representations of multimedia content on HDR display. The Exynos 9 Series 9820 is expected to be in mass production by the end of this year.